The trail includes five stops within Clifton and is approximately 1.5km long (blue trail). Optional sixth stop is an additional 1 km (pink trail). Begin at Clifton Hill House, Lower Clifton Hill, BS8 1BX. The oldest rocks beneath Clifton are Devonian Old Red Sandstone, lower Carboniferous limestones and sandstones, and Upper Carboniferous Coal Measures. These are sediments deposited during a long period of fluctuating sea level. In the Permian period, formation of the supercontinent Pangaea caused uplift of existing landmasses which were consequently subject to strong erosional forces. The resulting detritus created the next generation of bedrock, and so the older sediments are unconformably overlain by Triassic conglomerates and sandstones, and Rhaetic limestones. Built in the 1740s, this former merchant’s mansion is now part of a hall of residence for the University of Bristol. The front of the building is faced with cream-coloured oolitic limestone, a rock not native to Clifton; it was extensively quarried in (and is eponymous to) Bath when it became fashionable in the 18th century. Bath Stone was deposited in a tropical shallow marine environment, similar to that of the Bahamas today. The rock comprises millimetre-sized ‘ooids’, small lithic grains coated in concentric rings of aragonite (preserved as calcite) mud. Other features, such as cross-bedding and calcite veining, are neatly captured in the end stone. Goldney House is also part of a university hall of resi- dence, although the main building is a modern addition to the early 18th century coach house and other outbuildings. The coach house wall is accessible from the pavement and is an irregular patchwork of Brandon Hill Grit, a coarse Upper Carboniferous quartzite sourced from nearby Brandon Hill. The rock was laid down as a deltaic sand coevally to the limestones of the Avon Gorge; coarser horizons in some blocks are evidence for ephemeral stream channels. Its distinctive pink-red colouration is staining from the overlying Triassic sediments. Continue on Lower Clifton Hill as it becomes Regent Street. Walk into Clifton Village and turn left along Royal York Crescent. To the south is Dundry Hill [600m]. Walk all the way along the terrace, turn right at the end into Wellington Terrace, and then second right into Caledonia Place [500m]. Though prevalent as a building stone in the city centre of Bristol, Pennant Sandstone is not as common in Clifton. This grey-coloured sandstone is rich in feldspar and micas, and was deposited in shallow waters in the Coal Measures. The poor cementation between individual grains made the sandstone easy to quarry; however, this is counterbalanced by its relative fragility and vulnerability to weathering. In Caledonia Place it has been employed as mounting blocks (to aid Victorian residents’ ascent into horse-drawn carriages). Clifton Suspension Bridge is Bristol’s most iconic land- mark and was designed by Isambard Kingdom Brunel in 1831 (but completed posthumously in 1864) to span the chasm between the Carboniferous limestone cliffs of the Avon Gorge. The base of the gothic towers are attractively faced with New Red Sandstone. Its distinctive red colouration reveals its subaerial formation in the deserts of Pangaea and layering from ancient sand dunes is preserved as cross-bedding. Originally built as a mill in the late 18th century, Observatory Tower was purchased over fifty years later by a local artist who installed a telescope and camera obscura (to project panoramic exterior views onto a screen). The rounded rubble walls comprise fossiliferous blocks of Carboniferous Limestone hued from the gorge, and provide a reminder of a time when the Avon region was submerged beneath a balmy tropical ocean. Descend to ‘Giant’s Cave’ beneath The Observatory to further explore the strata of the Gorge. 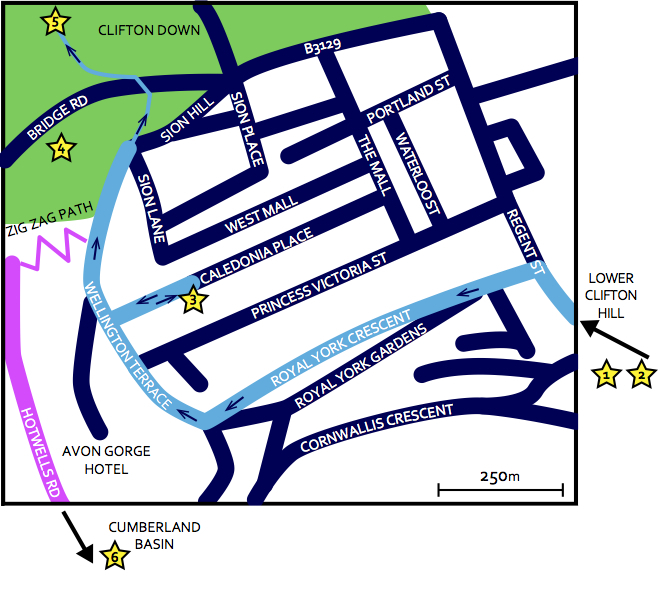 For a longer addition to your excursion, retrace your steps towards the Avon Gorge Hotel and take the Zig Zag footpath down to The Portway. Turn left and walk towards Bristol City Centre. Take care when crossing the busy road - it is best to walk over the pedestrian footbridge which begins in Granby Hill [∼1km]. The Cumberland Basin was excavated in 1809 when the River Avon was diverted to form a floating harbour and granite is used as capping material on the channel walls. Petrolographic analysis has shown it to be Bodmin Granite, part of the Cornubian batholith that is exposed throughout Cornwall and the Channel Island. This igneous rock formed a result of a huge mass of magma intruding into the crust during Variscan orogeny (∼275Ma). Though the surface has weathered to a smooth finish, individual crystals of grey quartz, white plagioclase and pinky- orange orthoclase feldspars, and dark-coloured biotite mica can still be identified.